This one was a bit confusing to grade because some things were pure joy in my mouth and the others.. well you'll see what I say about the others. Another one of chef and restaurateur Ritu Dalmia's ventures. The place has a warm cosy feel to it. Perfect to spend your time chatting, drinking some good wine, while taking your time, going through the menu, dish by dish. Try and grab a window booth. I personally quite enjoyed this. I was glad the phyllo layers were kept dry and not buttered/oiled especially with the goat cheese filled center. The ripened vine tomatoes literally burst in your mouth with their delicious tangy juices. It was not as heavy as it sounds actually quite light. Mmmm goat cheese! Now I'm sure your mama told you not to mix your proteins but then what's the fun in that.. I love bacon I can eat it with just about anything!.. And I also conveniently happen to love prawns so its a no-brainer that this was on my table. The dish is actually called smoked bacon wrapped prawns so it was deliciously .. well yes smokey. Nice sweet balsamic glaze.. The pickle and onion relish was a nice touch side by side but I got tired of it after the first few bites. I just had a teeny bite as it was not one of my many orders. A little over drenched in dressing so I cannot even begin to imagine what that extra bowl of dressing was doing there! A little salty but overall was OK. Not much explanation needed it was a Caesar. Honestly, I was expecting the pizza to be better. Even though, the crust was nice and thin, I would have liked it to have been a little lighter. Secondly, for something that sounds so flavourful it was a bit bland. Think they forgot the salt because that addition went a long way. Nevertheless, I'd order a pizza again and try some of the other toppings. This was the most disappointing dish on our table. The pasta was too thick and heavy. Usually I love ravioli with a simple sage or basil butter, but basil butter was totally insipid. I could not even taste the basil or strangely the yummy saltiness of the butter, so i really don't know what that sauce consisted of. Quite avoidable. Who doesn't love a good red velvet. The cake was super moist and the vanilla butter icing was a perfect partner to this delicious crime. All the desserts looked quite good, including the carrot cake which I didn't get in the picture. So I have an aversion to coffee. I guess god took mercy on my body and decided there has to be one vice she doesn't have! It looked nice I suppose and I was told it wasn't bad. The menu is creative and though it does resemble most of her other cafe menus its still tasty and fun to experiment with. REVISION REVIEW: - Okay so I have been back a couple more times and I have been forced to revise my rating from a 4.0 to a 3.5. I just find that the food is too inconsistent. And even though some dishes are amazing some are just quite unforgivable. 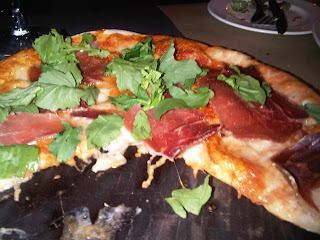 Parma Prosciutto and Rocket Pizza - The crust was too thick and soggy. 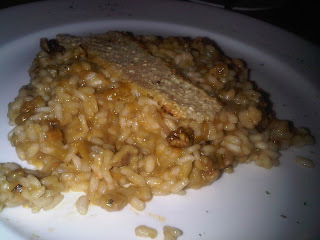 Pumpkin Risotto with Candied Walnuts - Ugh we had to return this one. I guess this was one of those dishes where it could have either been really good or just awful. No prizes for guessing the right answer! It had this strange muddy taste. Just not very appealing overall. 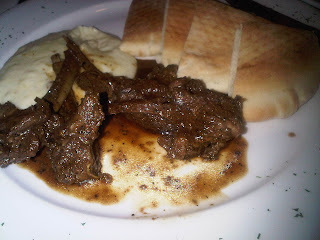 Cochin Mutton Chops - This was the "Special" that wasn't very special - Was not bad but not anything I would want to pay money to eat either. 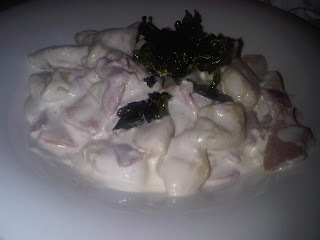 Gnocchi with 4 Cheese and Ham -Quite tasty. Gnocchi was light and fluffy. The dish of course very heavy, but I asked for it! 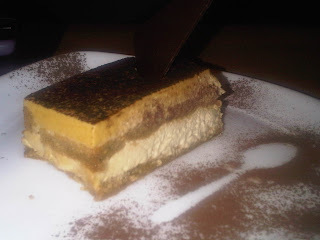 Tiramisu - I abhor coffee. Probably the only edible thing I cannot stand. But my friends The Great Tiramisu Queens rejected it after the first bite itself and proceeded to devour my cheesecake instead! 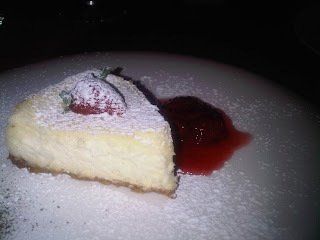 Classic Cheesecake - This was divineeee! Creamy goodness. The strawberry compote on the side made it even more special. Budget: Mid Range - About Rs. 1000 per person lunch.